For the past few decades, Oil and Gas reserves have played a major role in the growth and development of Qatar. Energy revenues have helped the country diversify its economic base, develop its infrastructure and achieve major recognition on the global map. Today eyes are shifting towards a different source of energy in Qatar and the gulf region generally. With its sun-belt location, Qatar enjoys a highly favorable climate to benefit from one of the world’s highest solar irradiance making solar energy a decidedly viable alternative. Are we on the threshold of a new energy future? Why do you have big renewable energy projects and customers in Qatar when electricity is cheap? In a number of countries around the world, solar energy has reached grid parity, meaning that it can now be purchased at a less or equal price to fossil generated electricity. While this is far from being the case in Qatar, the Government’s support of renewable energy is highly evident in the country’s sustainable development vision. With a persistent increase in energy demand, the need for energy diversification has gained a front and center position on the national agenda. Remember that the price we pay for our electricity in Qatar is significantly lower than the price of producing it, being governed by subsidies. From that perspective, investments in renewable energy are seen as a legitimate alternative; more so with the dropping costs of green technologies. How are current installations of solar systems performing in Qatar? Seven out of our large portfolio of renewable energy projects have been commissioned in Qatar in 2014. Although it may seem a bit early to make a long recording of their efficiency, it is worth noting that initial data points out matching results to simulation estimates given to clients in the design phase of their project. That is because our estimates are based on accurate local data, specific to each project. In other words, systems are performing exactly as expected. 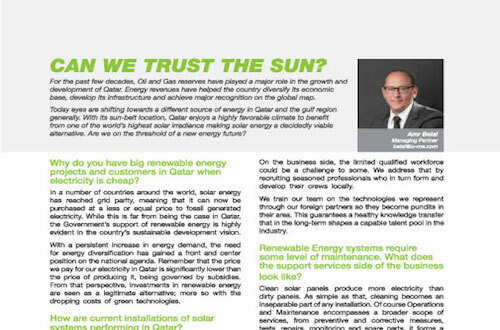 Year-round sunshine gives Qatar an excellent opportunity in deploying solar energy systems. With that as an established advantage, we move to tackling factors that may otherwise impede the stable operation of these systems. What are some of the obstacles that curb renewable energy deployment in Qatar? They are mostly short-lived, or else can be subdued, if we consider technology and business factors. For example, it is an ongoing debate that dust has an important impact on the output of solar systems. A standard tilt angle for the panels coupled with regular maintenance can easily overcome this element. The fact that our system design accounts for dust and fluctuating temperatures at an early stage also makes output estimates more reliable. On the business side, the limited qualified workforce could be a challenge to some. We address that by recruiting seasoned professionals who in turn form and develop their crews locally. We train our team on the technologies we represent through our foreign partners so they become pundits in their area. This guarantees a healthy knowledge transfer that in the long-term shapes a capable talent pool in the industry. Renewable Energy systems require some level of maintenance. What does the support services side of the business look like? Clean solar panels produce more electricity than dirty panels. As simple as that, cleaning becomes an inseparable part of any installation. Of course Operations and Maintenance encompasses a broader scope of services, from preventive and corrective measures, tests, repairs, monitoring and spare parts, it forms a stand-alone service contract. When delivering projects, we can make O&M recommendations based on factors that govern each installation. For example the size of an installation guides the choice of cleaning, manual or automatic; its location and accessibility influence dry versus wet cleaning technique. Apart from cleaning, we assign task-related project teams who ensure timely reporting and flexible on-site service timelines. What would Qatar look like when solar gains ground? We foresee an opportune future for solar energy in Qatar. This is evidenced by the larger sized projects being tendered and their growing diversification. The country’s energy targets being converted into projects on the ground will continue to support the growth of this sector. In time, we hope to see adequate reforms that in turn will encourage the private sector to catch up and contribute to this shifting energy infrastructure.